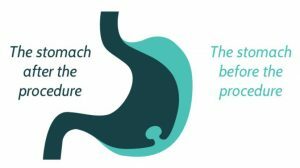 The POSE® procedure involves the creation of folds in the upper and lower parts of the stomach, restricting your portion size and prolonging satiety. The BMI Clinic’s Dr Sartoretto is the first to perform the POSE® procedure in Australia. How does the POSE® procedure work? Folds in the upper part of the stomach narrow the stomach, and encourage food to fill the top of the stomach first. This improves hormonal signalling of fullness, helping you to feel full sooner. Folds applied in the mid section of the stomach help to shorten the stomach and reduce its volume. The helps you to feel full from smaller amounts of food. The folds in the lower part of the stomach delay gastric emptying ie. slow the movement of food out of the stomach, prolonging satiety and your sense of fullness. Is the POSE® procedure permanent? The stitches used in POSE&reg; are very durable and do not break easily. Furthermore, the stitches effectively create scarring, typically within 4-6 weeks of the procedure. This scar tissue reinforces the stitch and is considered permanent, and is highly likely to remain, even if the stitch is broken or removed. In this manner, the folds created by POSE®, if allowed to heal appropriately, are permanent. However, given the adaptability of the human stomach and metabolism, appetite and weight loss results may change over time; this phenomenon is seen in all weight loss procedures. As such, while the procedure is likely to produce permanent changes in the stomach, these changes may not be permanently effective. The POSE® procedure will be completed by your Bariatric Endoscopist within one hour in a day hospital, under general anaesthetic. You will be able to be safely discharged from the day hospital on the same day. The procedure is endoscopic, which means no incisions are required. Instead, a flexible tube with a camera (endoscope) is inserted into your stomach via your mouth. Folds are created through the stomach and secured using a special tool (anchor). Recovery from the procedure typically takes 2-3 days, during which time some degree of pain or nausea may be experienced. Medications will be used to minimise your symptoms during this period. A short period of fasting is required to permit the healing of the stomach, followed by several weeks of a liquid-based diet, before returning to a normal diet. The POSE® procedure is a tool to aid weight loss, giving you a kick-start by allowing you to control portions and manage your appetite, as you develop healthy and sustainable habits. We know the POSE® procedure is most effective when accompanied by a lifestyle program, which is why at The BMI Clinic, the POSE® is paired with either our Silver, Gold or Platinum lifestyle program, delivered by a team of weight loss specialists, including Bariatric Physicians, Nurses, Dietitians, Exercise Specialists and Behavioural Coaches. Data from our own clinic demonstrates the more a patient engages with the team, the greater their weight loss. How much weight can I expect to lose following the POSE® procedure? The more you engage with your team, the more successful your weight loss journey will be. In general terms, patients typically see 18% weight loss after one year, or an average of 18kg for an individual of 100kg. However ultimately, the amount of weight you lose and maintain will depend on how closely you follow the advice of your medical and allied health care team.